Not to be confused with the groat coin, or grain grits, or the maize porridge grits. any grains such as oats, wheat, barley, millet or rye etc. Groats (or in some cases, "berries") are the hulled kernels of various cereal grains, such as oat, wheat, rye, and barley. Groats are whole grains that include the cereal germ and fiber-rich bran portion of the grain, as well as the endosperm (which is the usual product of milling). 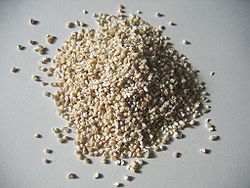 Groats can also be produced from pseudocereal seeds such as buckwheat. Groats are nutritious but hard to chew, so they are often soaked before cooking. Groats are used in soups and porridges: steel-cut oats are simply sliced oat groats. In North India, wheat groats are known as dalia and are commonly prepared with milk into a sweet porridge or with vegetables and spices into salty preparations. Groats are also used in some sausages, such as black puddings. A traditional dish from the Black Country in England is groaty pudding (not to be confused with groats pudding). Groaty pudding is made from soaked groats, leeks, onions, beef, and beef stock, and baked up to 16 hours; it is a traditional meal on Guy Fawkes Night. Coarse barley flour is made by milling barley groats. The grain is cleaned, sorted by grain, size and peeled (if necessary) before being hulled. Additionally, the grains can be sliced on a "groat cutter", which can be adjusted to cut fine, medium, or coarse groats. Regardless, thereafter the groats are freed from any adhering parts of the shell by a brushing machine. In the case of cut groats, their fragments are sorted according to size by sieving. Oat groats: these are a good source of avenanthramide. ^ Ensminger, M.E. ; Ensminger, A.H. (1993). Foods & Nutrition Encyclopedia, Two Volume Set. Taylor & Francis. p. 164. ISBN 978-0-8493-8980-1. Retrieved May 30, 2016. Wikimedia Commons has media related to Groats.